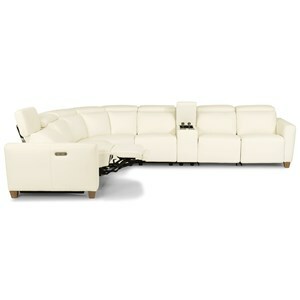 Bring a modern feel into your living room and create a one of a kind space with this sectional sofa. 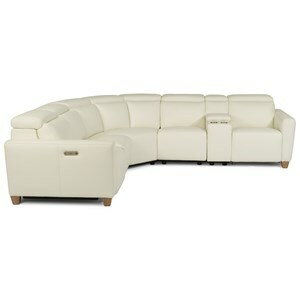 A reclining arm section and a chaise on this piece offer the perfect places to kick up your feet and relax. A storage console allows you to keep magazines or TV remotes in one place, while also providing cup holders. The Arlo Contemporary Sectional Sofa with Chaise and Console by Palliser at Reeds Furniture in the Los Angeles, Thousand Oaks, Simi Valley, Agoura Hills, Woodland Hills, California area. Product availability may vary. Contact us for the most current availability on this product. 41130-70 Armless Chair 2 32" 41" 39"
41130-09 Corner Curve 1 48" 48" 39"
41130-7P LHF Wide Recliner Power 1 38" 41" 39"
41130-56 RHF Chaise 1 38" 67" 39"
41130-W2 Console 1 13" 40" 35"
The Arlo collection is a great option if you are looking for Contemporary furniture in the Los Angeles, Thousand Oaks, Simi Valley, Agoura Hills, Woodland Hills, California area. 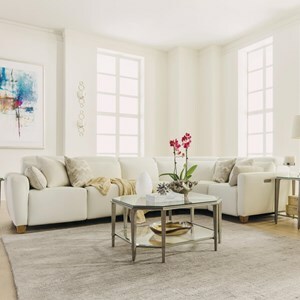 Browse other items in the Arlo collection from Reeds Furniture in the Los Angeles, Thousand Oaks, Simi Valley, Agoura Hills, Woodland Hills, California area.